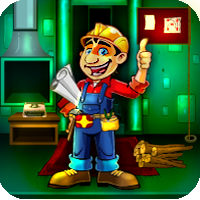 8BGames Lean Monkey Escape is a point and click escape game developed by 8BGames. Imagine that you went on vacation to a fantasy forest. There you saw a monkey trapped inside a cage. Monkey looks very lean; seems like haven’t take food for a long time. Find some hidden object and clues to solve some interesting clues to rescue the monkey before it starves till death. Good luck…Have fun! !